The best just got a lot better. The new Pre-Alarm security TCP-IP based bus-level interface module that can upgrade your DSC PowerSires panel and Honeywell Vista alarm system. Our new Pre-Alarm Module allows you to view the status of your security system just like standing in front of your keyapd at home and even control your home alarm panel through a standard web-browser or Smartphone. 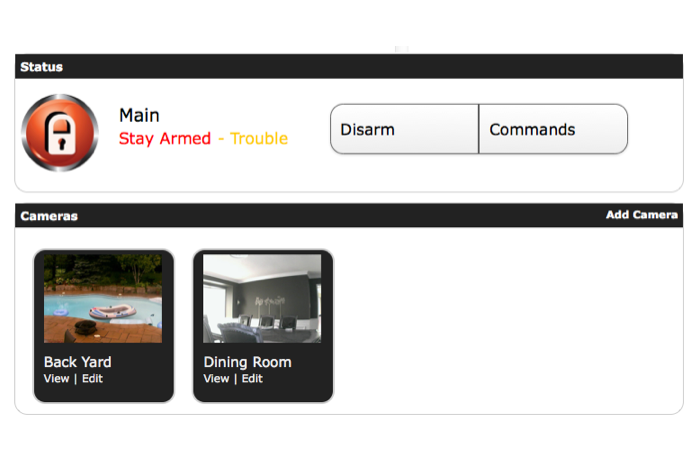 Our Pre-Alarm interface board added to your security system allows you to control your DSC or Honeywell security system from any internet connected computer, tablet, or smartphone including any iphone , blackberry and Android devices as seen on TV. Not every security event is an emergency. Keep track of what is happening at your vacation property when you are home, and keep watch on your home while you are vacationing or at work. Our new Pre-Alarm interface board is one of the most economical options for keeping in constant connection with your properites through your computer or smartphone. Event notifications can be sent by email or SMS text. Receive a text or email to notify you that your son or daughter has arrived home or the dog walker has come by. Add cameras for increased security. Live video can be viewed from your internet connected device. Know who is at your door or view when your son or daughter arrives home from school. Our Professional monitoring center will still contact the Police upon receipt of intrusion signals , you will just know about it quicker than you ever dreamed of. Our Pre-lock technicans can upgrade your existing DSC or Honeywell alarm system to provide you access to your security system from anywhere in the world 24 /7. receive alarm notifications when the system is not even off so you are now in full control and will know if any window door, is open or closed. Our new Pre-Alarm module is ready when you are and we can add this feature to almost any security system , even if we currently don't provide your home alarm monitoring ask us how easy it is to become a Pre-Lock Customer. **New** TPI - programmer's and integration interface. **New** Expansion Header - add new hardware modules as they become available. See at a glance system status on a map in ESP interface. New "Smart Phone" optimized version of the ESP portal. Works with iPhone, Android, and Blackberry. we have it all, and so can you. Let's face it getting information from your alarm system is not always a emergency that requires the Police. With the addition of our new GPS tracking pendant and emergency unit, you can give your loved ones something that is just a push of a button way. that can alert you when they need help. You will be able to also pin point the location of where they are anywhere in ontario. concerned for their safety on campus? We also have a personal GPS tracking unit equipped with a panic button. Inquire today how easy it is to upgrade your existing security system and receive 3 months free Pre-Lock Smart Phone access!!! !